The primary image of feminine Divine Love in the West is Aphrodite Greek Goddess of Love or her Roman equivalent, Venus. Unfortunately, several things can serve to confuse our understanding of Holy Aphrodite as a representation of the Universal Love of Dea. In many, especially later, representations, she is associated with sexual desire and purely carnal emotions. This confusion became so great that Plato and the neo-Platonists divided the influence of Aphrodite into two separate and distinct categories: Aphrodite Ourania (Celestial Aphrodite) and Aphrodite Pandemos (which is probably best translated as "common", or "vulgar", Aphrodite). We should not understand this latter designation as a profanity against Aphrodite, far less against the principle of Universal Love itself. Rather, since all earthly things are the reflections of things celestial, this distinction separates the true and pure Aphrodite Greek Goddess of Love – who is simply the Greek name for the Universal Divine Love – from the distant and distorted reflections of that Love among profane individuals. Let us then look at Aphrodite Greek Goddess of Love and see who She really is. Aphrodite is by no means purely Greek. She has counterparts in Sumerian Inanna, Babylonian Ishtar, Syrian Astarte and, of course Roman Venus. She has parallels with Indo-European dawn-goddesses such as Sanskrit Ushas (Greek Eos/Roman Aurora) who in early patriarchal and pre-patriarchal times were worshipped as very fundamental forms of God. In the first place, then, there is no doubt that Aphrodite is our Mother God, worshipped as Supreme Deity in pre-patriarchal times, and so fundamental that She crosses the great human language-groups, being found in both Indo-European and Semitic cultures. So how does this face of the Universal Mother God become Aphrodite Greek Goddess of Love? Let us understand first that every Face or Name of Dea is Dea seen in the light of one of Her fundamental Qualities. In this case, the Quality She manifests is that of Love. Love is one of the most fundamental aspects of God, so much so, that from a very important perspective it is said that God is Love. When God is seen as the Divine Sun, Her two primary Graces are Light and Warmth. Light is the Divine Wisdom (Sophia) and Warmth is the Divine Love, known to the early Greeks as Aphrodite. The two great Paths to God are the Path of Light, or Wisdom (Sanskrit jnana marga) and the Path of Love (Sanskrit bhakti marga). In her pure and original Form, Aphrodite Greek Goddess of Love – Aphrodite Ourania, the Celestial Aphrodite – is what the Hindus call bhakti: that Divine Love that gave rise to the creation of the Universe and that draws all created beings back to their true home in the Universal Mother God. From this Love, the first and all-creating Love, all other loves flow. The love of beauty is the love of that Divine Beauty which is the Source of all earthly beauty. The love of other humans is ultimately the love of the Divine Light that burns in each of us. In the traditional story of the Sleeping Beauty, we see how human love, truly experienced, is the image of Divine Love. Sleeping Beauty is at once the Hidden Treasure of the Spirit, sought for by the questing soul and the sleeping soul awakened by the kiss of love. Her names are Princess Aurora and Briar Rose. Aurora, as we have already seen, is a name closely associated with Aphrodite, and her primary symbolic flower is the rose. Celestial Aphrodite is first the Love of God for Her creatures, secondly the love of creatures for God, and thirdly the divine Love as expressed and experienced in the love of creatures for each other. Aphrodite Greek Goddess of Love is often confused by the modern patriarchal mind with Aphrodite Pandemos, the vulgar pseudo-Aphrodite. A typical patriarchal mistake, for when unspiritual men think of the feminine they think primarily in terms of lust. 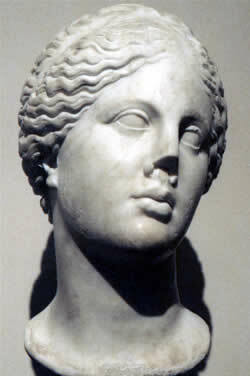 However, the true Aphrodite Greek Goddess of Love, is Aphrodite Ourania, the Celestal Aphrodite. Deanists call her Sai Sushuri. She is not other than the Divine Love Herself, in the form of spiritual devotion on the part of humans and loving care on the part of Dea. She is also the Source of all earthly beauty and of human love in its purest and truest form, in which the love of the beauty of mind, body, and soul in other creatures is a stepping-stone toward the Divine Love Herself. Once we understand this, the allure which so many feel toward Aphrodite Greek Goddess of Love becomes clear in all its beauty. The confusion with the vulgar shadow of love drops away and the path lies clear and shining toward our Celestial Home.